1.) Flaunt your unibrow! You don’t need Tyra Banks to declare that you are America’s Next Top Model in order to think of yourself as beautiful, fly and fierce! Frida created her own style that made her always look like a work of art. From her dresses to the flowers she wore in her hair to the beautiful Tehuana jewelry she rocked, Frida saw the supermodel in herself and took great care to extract and play-up every bit of her beauty—unibrow and all. So get your head out of Vogue, Cosmo and Essence and be your own fashion statement. Take your curves, your big eyes, your husky eyebrows, your short fro, your muffin-top and your dark mahogany skin and create your own positive image of beauty. To be sure, there is no greater runway than the runway of life. 2.) When life knocks you flat on your back, look up and paint the sky. In 1925, Frida was involved in a near-fatal bus accident. After the accident she was forced to stay at home, and at times she was bound to her bed and lay flat on her back, her body in a plaster cast, for weeks sometimes months at a time. Yet nothing, not even pain and immobility, kept Frida from working and seeking out her passions. Even towards the end of her life when she was extremely sick and had to have her leg amputated she bravely stated, “Feet, what do I need them for, if I have wings to fly?” Whether you are dealing with a health crisis, the end of a relationship or marriage, or you’re out of work and struggling to make ends meet, there is always a way to happiness. In her darkest moments Frida somehow knew how to conjure light. Let’s follow her lead and try to look-up. 3.) Live your truth! As popular as reality television has become, the more fake people seem to be. The irony, of course, is that reality shows are scripted and seem to thrive on conflict, superficiality and stereotypes. Frida’s paintings are often violent-looking, bloody, and severe. But they simply represented the truth of what was happening to her and how she felt. She wasn’t going around popping bottles of tequila and bragging about how fabulous she felt when in fact she was enduring a great deal of pain. Even about her marriage to a philandering Diego Rivera, Frida Kahlo kept it real and shared this: “I suffered two grave accidents in my life. One in which a streetcar knocked me down. The other Diego.” How can we really be happy if we don’t confront our pain? How can we be totally confident if we don’t recognize our shortcomings? Stop fronting and try a little authenticity for a change. It goes a long way. 4.) Infertility does not make you less of a woman (or man). A very young Frida suffered serious injuries as a result of her accident, including a broken spinal column, a broken collarbone, broken ribs, a broken pelvis, and eleven fractures in her right leg. Also, an iron handrail pierced her abdomen and her uterus, which seriously damaged her reproductive ability and caused her to have three miscarriages. Not being able to have a child was the cause of so much anguish for Frida yet she focused on life and creativity. She would probe the insides of flowers and fruit to examine the organs beneath the wounded flesh. “I paint flowers so they will not die,” she once said. By finding life in other facets of nature she was able to attune herself to her own natural life-force. Her womb may have been punctured, but she worked to keep her spirit whole. I understand from talking to women who have had problems conceiving that there looms this feeling of failure as a woman. This devastation will not only undermine one’s self-esteem, but it can ruin a relationship. I understand there are currently a number of options including IVF and surrogacy available to women and men, which is great. However, I also know so many women cannot afford these options. Then what? I don’t have the answer, but because I also don’t have children (by choice) I can understand the devaluation one experiences for not being a mother. Even Oprah got flack from Barbara Walters. The idea of giving life and nurturing has to somehow move beyond traditional notions of pushing out a baby (my grrrl was even telling me about the backlash she got for having had C-sections vs. “natural” child birth… jeesh!) or else we will have entire communities of women feeling less than the beautiful whole that they truly are. 5.) Being alone is not the end of the world. It’s actually a great time to get to know oneself. I’m sure we all know someone who can’t stand to be alone. Someone who has to always be out and about with his or her crew? Well watch out for those folks because if they can’t stand to be by themselves, chances are you will have a hard time dealing with them too. First off “alone” and “lonely” are two different situations. The former is a physical one and the latter is a mental one. 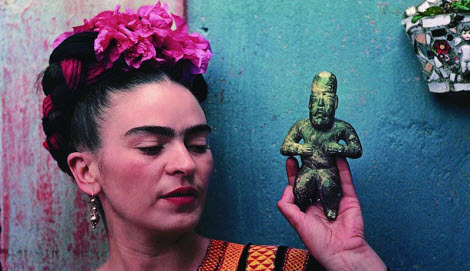 As a result of her convalescence Frida Kahlo learned to master her fear of being alone. She did this through studying herself via self-portraiture. In an interview she said, “I paint myself because I am so often alone and because I am the subject I know best.” She then concluded, “I think that little by little I’ll be able to solve my problems and survive.” Learning how to spend time with yourself whether in meditation, while sipping on sake at the sushi bar, lying around reading a book or while touring the South of France is crucial if you really want to love yourself fully and if you want to improve yourself. Frida Kahlo is an inspiration to me for these reasons and many more. Please forward and post this link as a tribute to a woman who was unafraid of being herself. I love these “life lessons” through Frida’s eyes. We can choose the cards we’re dealt, only how we choose to to play them. She’s a real good example of this.